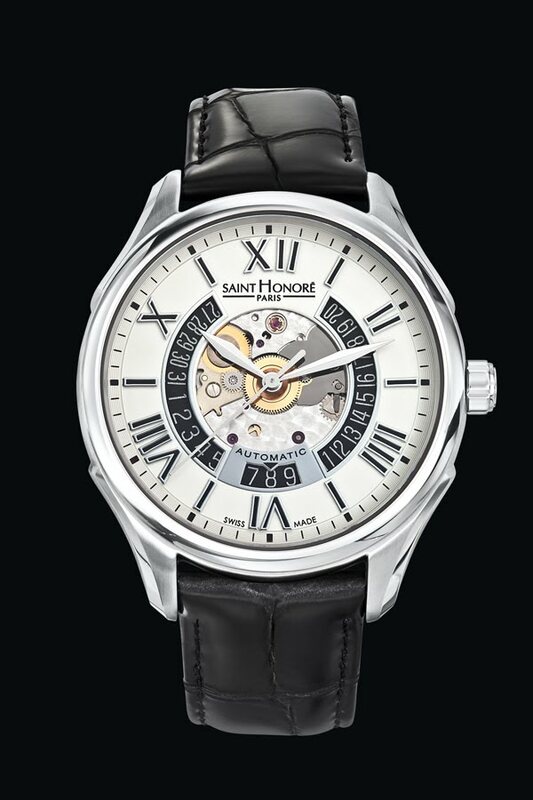 A far cry from the excesses of some timepieces, the latest men’s watch from SAINT HONORE, Carrousel, goes back to basics with its pure, clean lines. Today, sophistication is all about a fine, sleek form and subtle, nuanced details, and a flat case-band, a sign of understated elegance. Carrousel fits the bill perfectly. Its clever, timeless design brings together watchmaking expertise and contemporary style with brio. The exquisite shape of Carrousel is enhanced by its elongated lugs, the line’s signature motif. With a diameter of 42 mm, the case combines a subtle blend of polished and brushed steel on the case-band and bezel. The particularly noteworthy Automatic Open Dial versions are the result of meticulous attention to detail: the dial, with its polished steel hour-markers, allows a view of the ETA 2824 movement; the innovative design of the hands adds a dash of originality and good taste, and when the watch is turned over, the beautiful movement can be admired through the transparent case-back. Available in Quartz, Automatic and Automatic Open Dial versions, Carrousel will delight elegant men looking for a contemporary timepiece that can be worn on all occasions.